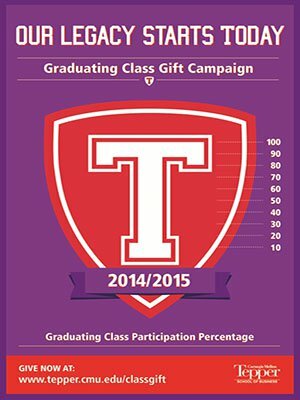 The Tepper School Class Gift Campaign provides graduating MBA students with an opportunity to reflect on their time at the school, come together and show class pride, and help ensure that future classes have a positive experience. 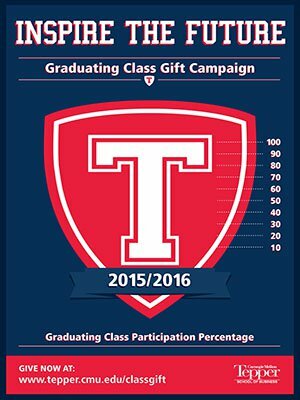 The class gift runs from fall 2018 through June 30, 2019. High student giving rates show alumni, recruiters, prospective students and other institutions that current students believe in the school, increasing the value of a Tepper School degree. Believe it or not, tuition only covers about 50 percent of the Tepper School’s operating budget. The school’s fundraising efforts help fill in the gap every year. 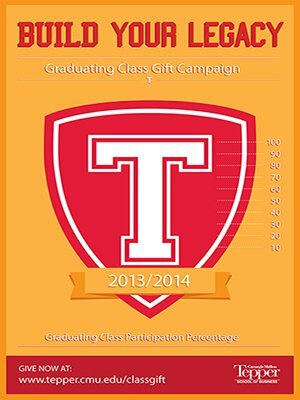 Class giving is a stepping stone to establishing a tradition of philanthropy at the Tepper School, ensuring the success of the school long after each class has graduated. Outstanding student participation is a catalyst for encouraging greater alumni support of the school. Have Questions About Class Giving? 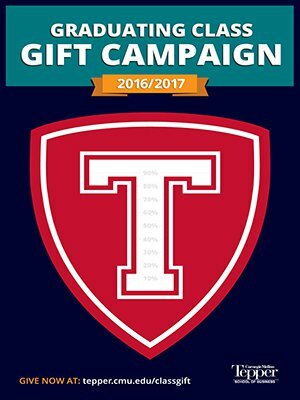 Make your gift online: tepper.cmu.edu/classgift (Full-Time) or tepper.cmu.edu/ptohclassgift (Part-Time Online Hybrid). Want to break-up your gift into budget-friendly payments and have it renew automatically? Select the “recurring” option under Gift Frequency to set-up a recurring gift. Credit Card Machine or Cash: During various events throughout the year, we’ll be collecting class gifts via credit card or cash. Processing of these gifts is delayed a few days. The fastest way to participate is to give online. What Are the Benefits of Being a Leadership Donor? Students can join the W.L. Mellon Society by making a gift of $500 or more to the Tepper School (typically donors must give $2,500+). Part-time students whose gifts are match-eligible through their organizations can join the society with a gift of $250 plus a 1:1 match. 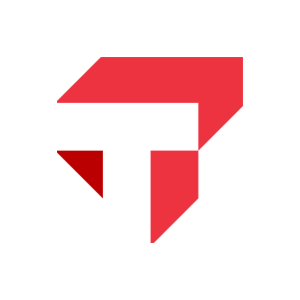 Review our database of matching companies. We recognize our exceptional student donors through exclusive interactions with the Dean’s Office and the Tepper School Alumni Board. Visit the W.L. Mellon Society page to learn more.